People burn their New Year's decorations at a donto fire. Even after the first three days of the new year have passed, Japanese observe a series of new year’s events. The new year season, called matsunouchi, continues for the seven days from New Year’s day to the January7th. People eat rice porridge made with seven kinds of vegetables on January 7th to give good health throughout the year. At the end of matsunouchi, New Year’s decorations are taken down, and people prepare to return to their daily lives. January 15th, which in the old lunar calendar would have been the first full moon of the year, is the “little new year”. 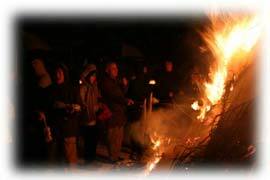 Many events, including donto-yaki, when people burn their New Year’s decorations, are held on this day. People bring decorations from home that are made from natural materials, such as kadomatsu (arrangements of bamboo, pine and plum) and shimekazari (wreaths and ropes made of straw and white paper) and pile them up at a local shrine or a public open space. After a Shinto priest offers a chanted prayer, the pile is set on fire. Eating a rice cake grilled on the donto-yaki fire will keep you healthy for the rest of the year.